The Financial Services on Nevis would continue to be of top priority due to the competitive advantage the island is believed to have in the service sector. That view was expressed by Permanent Secretary in the Ministry of Finance on Nevis Laurie Lawrence, when he delivered remarks at the Nevis Financial Services Regulation and Supervision Department’s 2014 Anti Money Laundering (AML) and Counter Financing of Terrorism (CFT) Seminar and Training workshop on March 03, 2014. The annual workshop which was held at the Occasions Entertainment Arcade under the theme “Redefining our Global Vision through Knowledge Enhancement,” was attended by a cross section of service providers and other partners in the financial services sector on Nevis. Lawrence regarded the Financial Services sector as an area in which small states could develop niche markets that could effectively compete in the global area. “By the development of niche markets, we can overcome the constraints of size by utilising ICT technologies to offer high-quality products and services to customers worldwide. However, we must narrow or eliminate the knowledge gap by investments in research and development, education and training and continuous learning. “If we are to succeed in this industry, we need highly-skilled workers who can create knowledge and keep pace with the rapid advances in technology,” he said. According to Lawrence, it was for that reason that it was of critical importance and gaveÂ further insight into the workshop. “It is designed to keep us on the cutting edge of developments in the financial industry especially in the areas of money laundering and terrorists financing. There is no question that the developed countries are imposing these standards on us to protect their own shrinking revenue base. However, the problems of money laundering and terrorist financing are real. “We are also witnessing a serious increase in the incidence of fraud in the Caribbean targeting financial institutions especially banks. Some of the perpetrators, many of whom are from developed countries, now have the ability to exploit loopholes in any system around the world. Consequently, the compliance function is becoming critical to protect our institutions and country from criminals,” he said. The Financial Secretary used the opportunity to urge service providers to allocate the necessary human and financial resources to improve compliance within their organisations. “Investments must be made in education and continuous training. In addition to participating in these workshops, I would like to encourage you to ensure that all directors and members of staff are certified in compliance. This is an extremely important area that will continue to grow in the future. “Persons with compliance training will also become more marketable in the financial industry as a number of countries are making it mandatory for financial institutions to utilise certifies officers to carry out the compliance function,” he said. 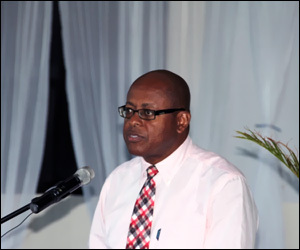 Mr. Lawrence stated that the St. Kitts and Nevis Financial Services Commission had already moving in that direction but told the small companies who could not afford to hire a compliance officer to share resources or employ a trained person on a part-time basis. The Financial Secretary also told participants that the time had come for them to take ownership of the issue and begin to make necessary changes in their organizations that would create a culture of compliance. He said he was aware that companies channelled most of their time and resources into marketing initiatives to drive growth and profits but often that objective was in conflict with the compliance function which was viewed by some as a cost rather than an asset. “I am firmly of the view that companies with a strong compliance culture will be the success stories of the future. They will be able to reduce the cost of litigation and attract high-quality business that will be looking for reputable institutions. “As the environment changes and fraud and money laundering increases, companies that ignore the compliance function will not be able to manage risk effectively and will eventually wither and die. In addition, the countries that are well regulated and implement measures to strengthen compliance will be the most successful in the financial industry,” he said.